What are Continuous Inking Systems? Tech-Wonders.com » Software » What are Continuous Inking Systems? Continuous Inking Systems (CIS) are aftermarket kits for inkjet printers. 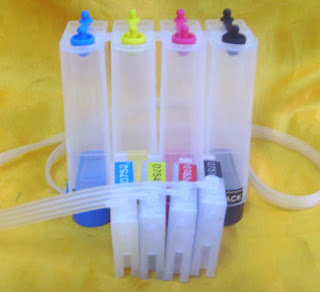 These systems supply ink to special cartridge through tubes which are connected to the bottles or reservoirs. The user should not worry of the cartridge running dry or about replacing them. The user can simply add ink to the bottles when they run low. The Continuous Inking Systems are especially designed to cover most Canon, HP, Epson and other printers. The bottles which are the part of the inking system are placed alongside the printer. The number of bottles varies according to the model of the printer. Every bottle is filled with proper color ink. In this system a tube runs from the bottle cap to the ink cartridge inside the inkjet printers. These tubes are bound with each other into a “ribbon” cable. The Continuous Inking Systems provides the users with a syringe for primary setup to clear the tubes with air and help them draw ink. Continuous Inking Systems are capable of large runs as photographs and other printing jobs can be carried out very easily without worrying about running out of ink. Other advantage of this sophisticated system is that it is cost-effective as the cartridge included is specially designed for longevity. The installation of Continuous Inking Systems is very easy and it takes only 5-10 minutes depending upon the kind of the kit and the printer. It comprises of two major steps-loading the cartridge and then installing the inks along with the carts and the tubes. Care must be taken so that the reservoir bottles are not positioned higher than the printer as the gravity could make the ink to flood which causes improper printing and affects printing quality. While installing the systems no permanent changes are made in the printer and the user can easily change it back to the standard cartridge. Continuous Inking Systems are easy to install and use and can be purchased online from the company dealer directly.